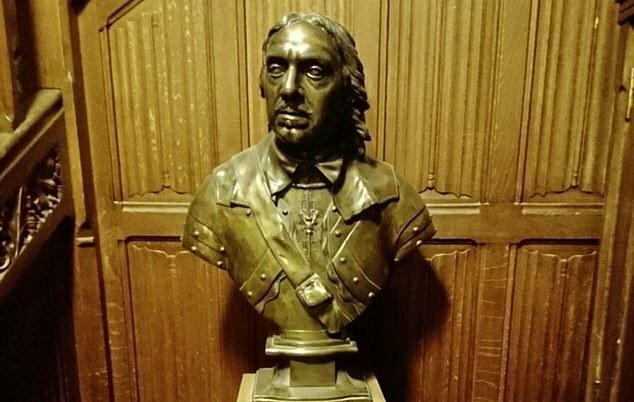 A Labour MP has vowed defiance after Commons officials moved a bust of Oliver Cromwell and installed a tamper alarm to stop him turning it to face the wall. The historic statue of the Lord Protector was relocated from its prime spot outside the Members’ Tea Room for ‘health and safety’ reasons after the year-long campaign by veteran backbencher Stephen Pound. 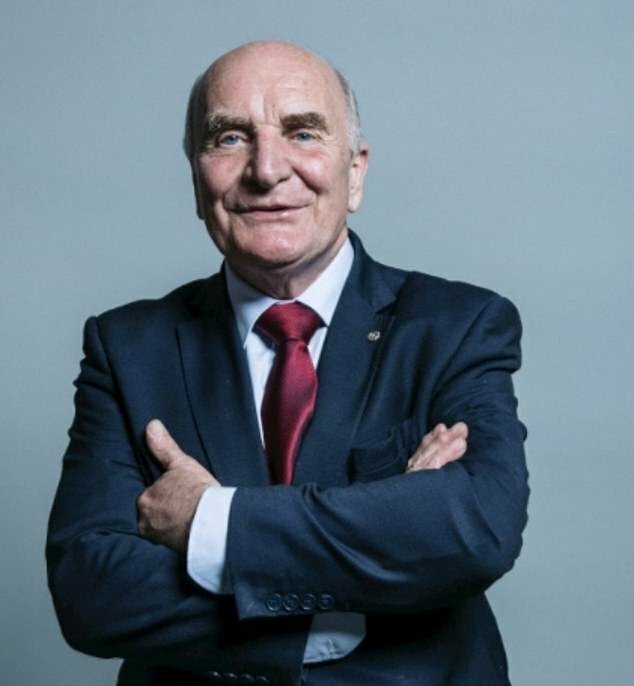 One senior Labour MP accused Mr Pound of behaving like ‘a total pr***’ – but other politicians said the Commons authorities had ‘panicked’ and overreacted to his protest. Mr Pound told MailOnline he had still not given up on getting rid of the ‘butcher’ – blamed in some quarters for ethnic cleansing of Catholics in Ireland – but complained that the bust had now been placed near his office at Westminster. ‘Somebody’s got a sense of humour,’ he said. Cromwell was a Roundhead leader against the Royalists in the 17th Century English Civil War, and became Lord Protector (but in Ireland is known as the ‘Butcher of Drogheda’)- effectively monarch and PM combined – after the execution of King Charles in 1649. His reputation is controversial, with some praising his efforts to unite and modernise the country, while others accuse him of slaughtering Catholics in Ireland. 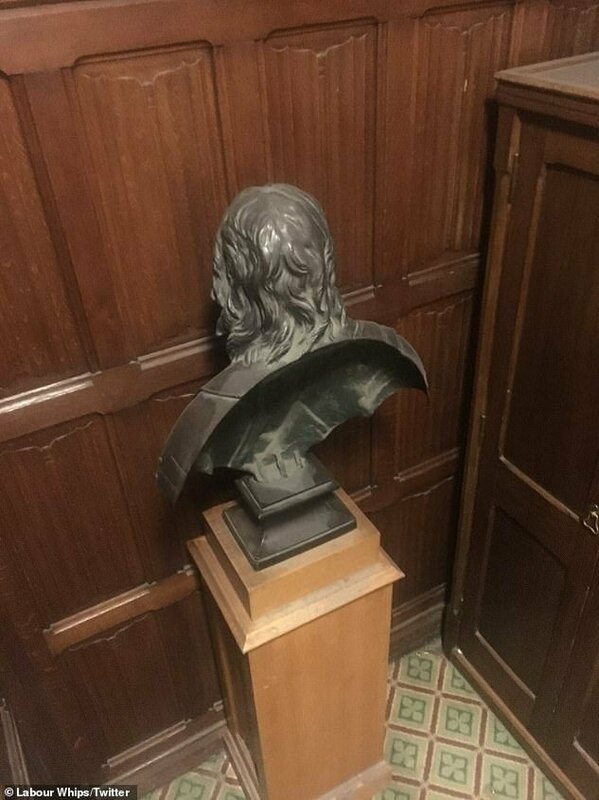 The bust, thought to be the only statue of Cromwell on the parliamentary estate, had been positioned in a stairwell beside the Members’ Team Room. But in the Autumn of 2017 the House authorities were forced to intervene when it was repeatedly turned to face the wall. They have also appealed for help in catching the prankster. However, the meddling persisted, and a few months ago the bust was shifted to 1 Parliament Street – near Mr Pound’s office. 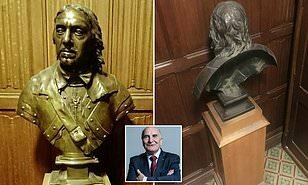 The MP said he still hoped to get the bust removed from Parliament altogether. ‘I am in negotiations with the authorities. His butcher stare gets me every morning when I come in,’ he said. Mr Pound said a ‘complicating factor’ was that Jeremy Corbyn did not share his hatred of Cromwell. But Tory MP Ian Liddell-Grainger said the authorities had been far too sensitive. ‘The whole thing is stupid. They panic about the smallest thing. It is crazy,’ he said. Commons sources suggested the cost of moving the bust and installing an alarm had been ‘minimal’. A House spokesman said: ‘In common with museums and galleries, individuals on the Parliamentary Estate are asked not to touch any statues, paintings or other works of art on display, due to the risk of damage to the artworks. With many thanks to the: Daily Mail Online for the original story.